Is eating at the computer a bad habit? It is, isn’t it. Welp. 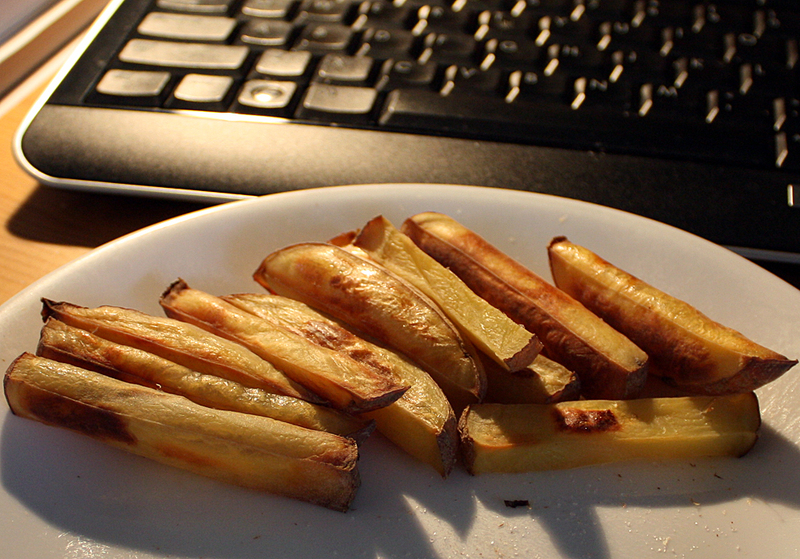 This is a red-skinned potato that I cut into the shape of French fries and baked in the oven, without any oil, for 45 minutes at 370 degrees F. That’s salt you see on the plate. I dip them in salt. Is dipping in salt a bad habit? This entry was posted in Uncategorized on April 1, 2015 by Bix. I’ve no right to call them “fries,” have I. They look delicious! I’ve not tried potatoes like this w/o oil, but will do so soon–very soon. I put them on a piece of parchment, on a cookie sheet, in a preheated oven. Cooking time depends on how many you have crowded together, 1 or 2 potatoes cook in about 45 minutes, 3 or more need at least an hour. They’re done when they puff up. They turn brown very quickly after they start puffing! Oh, one more thing, I turn them halfway through. I don’t know if you really need to do that. I started doing it in the beginning to see if they were sticking and I never stopped the habit. Looks like a fry, must be one. I usually coat my potatoes with oil before baking, but I have tried them both ways. I’ve never met a potato I didn’t like.